The Bruce Lee Body, is the epitome of physical male perfection for many. It is the perfect blend of aesthetics and functionality. And if you want to develop a Bruce Lee body then Isometrics is one of the best options for achieving your goal. Bruce Lee's strong and agile physique was the result of years of exercise and training, many of which involved the use of Isometric training in order to develop his muscle's elasticity and strength. So if you want to develop a similar body, you will need to carry out much of the same training that he did. .
What makes Isometrics relevant to martial artists is that they are meant to make your muscles stronger, faster and tougher, as opposed to simply making you look more buff. By contracting various muscles throughout your body and holding them at a specific level of tension for a certain level of time (usually around 7 to 12 seconds), they gradually become tougher and more elastic thanks to the added tension. Furthermore, these activities also causes your muscles to contract without changing their length, which is critical for gradually developing flexible muscles all throughout your body. These Isometric exercises are then combined with special breathing routines and other minor exercises to create a more well-rounded approach to muscle development. This is the essence of functional fitness. You look great, but your can function even better. 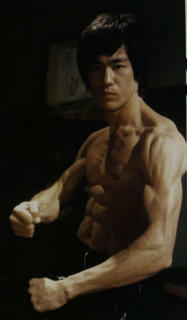 A great body then, the Bruce Lee Body, is a by product of being stronger and healthier. Allowing you to enjoy your life to its fullest potential. Aside from muscle development, it's also worth mentioning that Isometric exercises cover the arms, abdomen, legs, back and chest. And it's also worth pointing out that these exercises are not just for the young, fit and youthful, There are even Isometric exercises for senior citizens to help them restore some of their youthful vigour as well as isometric training for young people who wish to develop their muscles at a very young age safely. Bruce Lee understood the importance of these goals to a martial artist, which was why he would daily perform Isometric exercises on various parts of his body, mainly on his limbs and upper back area. These training allowed Bruce Lee to develop his famous lean-looking muscles, the famous Bruce Lee Body and it is these muscles which allowed him to develop the speed and skill that he displayed on his numerous movies. The point to remember here is that the goal of Isometrics is to develop bodies which combine elasticity and speed with raw physical strength. This is an essential point to remember because in an actual combat scenario, you will need to move, attack and respond quickly, and you can only do that if you develop your body to move, respond and attack in a certain way. The fact is that many of the moves that most martial artists take for granted and in fact, many of our daily activities are only made possible with flexible and well developed muscles, and many of these can be more easily achieved if you undergo Isometric exercises early on in your martial arts training. If you want to develop a Bruce Lee body yourself then check out my complete Isometrics Course - 7 Seconds to a Perfect Body. Over 250 pages of detailed instruction, isometric routines and more, along with over 100 full colour HD photos, it will help you build the body of your dreams with JUST SECONDS of Exercise a day. Learn more - here. You've been reading about the Bruce Lee Body and how Isometrics can help you build one. Check out my other articles on Bruce Lee here.